Carpentry skills are truly useful, not only for carpentry professionals but also just for amateurs working around the house. This free Introduction to Carpentry course is the perfect first step for you to learn the skills needed for effective carpentry. By the end of the course, you'll understand the most important carpentry building materials, construction methods, fasteners and adhesives, and power tools. Not bad for a few hours of study. A modern-day carpenter's work is not just confined to residential projects. Commercial and construction sectors have opened up a whole new area that requires trained and skilled carpenters. This course will first give you an overview of the history of carpentry and introduce you to its flourishing modern trade. You will learn about the carpenter's responsibilities and safety obligations as well as carpentry apprenticeships and job opportunities that await qualified individuals. Next, you will learn about important building materials such as lumber, plywood, building boards, engineered wood products, and pressure treated lumber. You will also learn how to calculate the quantity of lumber for a project and study concrete block construction. This carpentry basics course will also cover commercial construction methods and discuss joining methods using fasteners and adhesives. You will also study the different kinds of hand tools and power tools used in carpentry. This basic carpentry training course will teach you a skill that will give you the satisfaction of building something out of nothing. This will be really useful for those doing some home improvements, and also for construction professionals who want to learn about modern carpentry practices and procedures. It will also benefit learners who are considering a career in carpentry. So, check out the course today, and improve your carpentry skills in no time. Having completed this course the learner will be able to: - Describe the history and scope of carpentry as a trade; - Identify the opportunities for carpenters in the construction industry; - Classify the various building materials used by carpenters; - List the most commonly used fasteners and adhesives used by people in the carpentry trade; - Explain the different types of hand and power tools available to carpenters; - Outline the general safety procedures and guidelines that should be followed to operate the tools; - Discuss the importance of employee responsibility and human relations to being successful in the trade. Great course for Carpentry beginners. An Apprentice must! 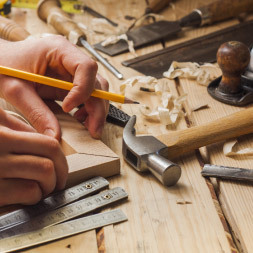 Having worked and continue to work in Carpentry, this course is a good introduction to the trade and only setting a couple of hours out of your day, and achieve completion of this course is very satisfying and rewarding.